Support your dog’s or cat’s joint health, lubrication, and mobility. Because they deserve the best. research-based blend of natural source ingredients providing all the protection and joint support benefits your pets need to live a full and active lifestyle. Does your raw fed or athletic pet have hip and joint problems? Are they slower to play, have trouble running up and down stairs? Look like they're feeling stiff? 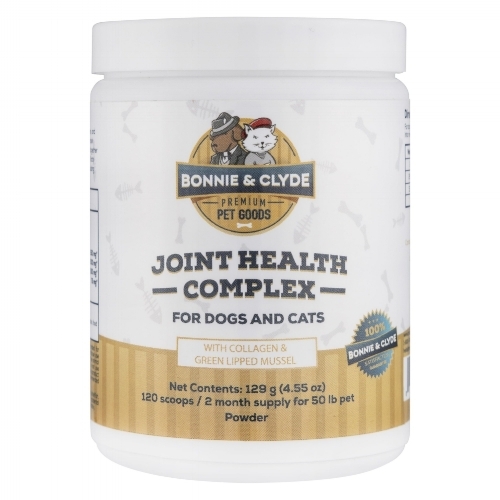 Bonnie & Clyde’s Joint Health Complex can help support their joint health, lubrication, and mobility. Almost all glucosamine and chondroitin for dogs and cats is from China, but not ours! This makes Joint Health Complex one of the few products that is free from Chinese ingredients. Unlike most joint supplements, Bonnie & Clyde is proud to keep the formula free of fillers, such as rice bran or cellulose. It's the ideal product for raw feeders and pet parents who prefer keeping it simple. 100% free from artificial preservatives and flavoring, food dyes, bulkers, binders, gluten and grain. Here are the quantities per scoop and why each ingredient was added. Green Lipped Mussel from New Zealand (250 mg): Sustainably harvested from the pristine waters of New Zealand. GLM contains joint protective ingredients: glycosaminoglycans, special omega-3 fatty acid called ETA, and a unique type of glycogen with anti-inflammatory properties. Our green lipped mussel is low-temperature freeze dried to save nutrients, unlike other brands who use air dried materials. It is also not treated with any harsh processing methods such as irradiation or steam treatment which can damage nutrients. Glucosamine from India (250mg): Made from the exoskeleton of wild-caught Indian Ocean shrimp. Helps support joint health in dogs and cats. Chondroitin Sulfate from the US (75 mg): Made from Canadian and US cows. Helps support joint health in dogs and cats. Why give my pet GREEN LIPPED MUSSEL and collagen? Several studies have shown health benefits for pets with osteoarthritis, including improved force plate results, increased vitality, and reduced limping. How long does a JAR last? IS YOUR PRODUCT GOOD FOR BOTH CATS AND DOGS?